The structure and function of synapses forms one of the most important areas of research in molecular neurobiology. We shall discuss the molecular detail in Chapters 15, 16 and 17. In this section we shall merely look in an introductory way at their organisation in the brain. Figure 1.16 shows the structure of a typical synapse in the CNS. The termination of the axon swells to form a 'bouton', as we noted in Section 1.3.1. 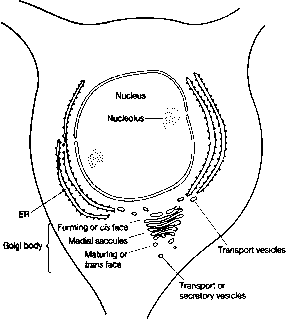 The bouton contains a number of small (20-40 nm) vesicles which are believed by most workers (there are some exceptions) to contain the molecules of a transmitter substance. The presynaptic membrane is separated from the postsynaptic (= subsynaptic) membrane by a gap of some 30-40 nm. Characteristically the postsynaptic membrane appears denser and thicker in the electron microscope than the presynaptic membrane. The presence of synaptic vesicles and this postsynaptic thickening enables the physiological polarity of the synapse to be determined; i.e. transmission always occurs across the synaptic gap in one direction - from presynaptic to postsynaptic membrane. Just as there are many different types of neuron and many different types of glia, so there are many different types of synapse. Indeed it would be somewhat strange if there were not for, at a conservative estimate, there are some 1014 synapses in the human brain. The structural and biochemical diversity is gigantic. Some of the different structures and arrangements are shown in Figure 1.17. The structures range from simple electrical synapses (='gap junctions') (see Chapter 7), through classical synapses, to synapses made en passant (sometimes called 'varicosities'), to reciprocal synapses and complicated groups of synapses. Figure 1.16 'Classical' synapse. Description in text. The figure shows that there is often evidence of some material filling the synaptic cleft. The figure also shows ridges projecting upwards from the presynaptic membrane. These ridges form part of the presynaptic grid (see Chapter 15). Figure 1.17 Varieties of synapse. (A) (a) Electrically conducting synapse; (b) spine synapse containing dense-core vesicles; (c) 'en passant' synapse or synaptic varicosity; (d) inhibitory synapse (note ellipsoidal vesicles) on initial segment of axon; (e) dendritic spine; (f) spine synapse; (g) inhibitory synapse; (h) axo-axonic synapse; (i) reciprocal synapse; (j) excitatory synapse. (B) Transverse sections through three neuronal processes: one axon (ax) and two dendrites (de) showing complex organisation. The stippled profiles around the group represent glial cells. 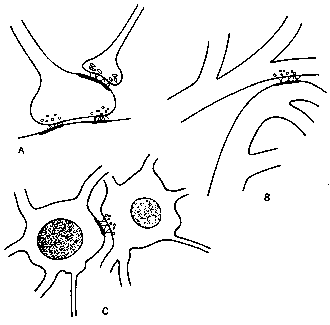 (C) Transverse section through three neuronal processes: one axon (ax) and two dendrites (de). The two dendrites form a reciprocal pair. They are arranged in a negative feedback loop so that excitation of the lower switches off the upper. (D) Reciprocal synapse made between two dendrites (de). In this case there is positive feedback. Excitation of the lower dendrite re-excites the upper. Figure 1.18 'Non-classical' synapses. (A) Axoaxonic synapse. The termination of one axon may control the activity another terminal. (B) Dendro-dendritic synapse. Synaptic appositions are sometimes found between the dendritic processes of neighbouring neurons. (C) Perikaryo-perikaryal synapse. Very occasionally synaptic junctions are made between adjacent perikarya. of that neuron contain only that one type of transmitter. Although many exceptions to Dale's principle are nowadays known (see Chapter 16), it remains a good first approximation. It is also to some extent possible to relate the transmitter molecules present in a synaptic terminal to the form of the presynaptic vesicles. Thus small spherical translucent vesicles are believed to contain excitatory transmitters such as acetylcholine or glutamate, whilst small translucent ellipsoidal vesicles are thought to contain inhibitory transmitters such as glycine or g-aminobutyric acid (GABA). Larger, dense-cored, vesicles contain catechol-amine transmitters, whilst large translucent vesicles probably contain peptide transmitters. Classical neurophysiologists understood the connectivity of the nervous system to be one way only - from axon to dendrite or perikaryon. It remains true that most synapses are axo-dendritic or axo-perikaryal (=axo-somatic), but in recent years other arrangements have been discovered. Axo-axonic synapses are quite common. This arrangement allows one neuron to control the synaptic activity of another. More recently it has been shown that dendrites also make synapses. Dendro-dendritic synapses have been demonstrated in the olfactory bulb, in the retina, in the superior colliculi and elsewhere. Finally it appears that synapses are sometimes made between perikarya. It seems, therefore, that all the possible permutations between neuronal processes are made somewhere or other in the brain. Some of these 'non-classical' arrangements are shown in Figure 1.18. It is clear from the foregoing paragraphs that the synaptic organisation of the brain is exceedingly complex and as yet far from completely understood. The dendritic and perikaryal surfaces of many neurons are densely covered with synaptic endings of various sorts. It has been computed that the large Purkinje cells of the cerebellum are exposed to over 100000 synaptic appositions. The dense investment by synaptic endings of various different sizes of the perikaryon of a spinal motor neuron is shown in Figure 1.19.